I don't know about you, but the Australian Centre for the Moving Image (ACMI) is one of our favourite places to go with kids in Melbourne. I've lost count of the number of times we've visited ScreenWorlds, a permanent exhibition on the ground floor of ACMI, celebrating the story of film television and digital culture. It's free to visit, and there's so much to do; video games to play; buttons to press; short video clips to watch; film memorabilia to admire, a flip book to make and a kid zone. Kids' Flicks screened in ACMI's cinemas offer the cheapest movie outings in Melbourne. Offering family gems from past and present. Movies tickets start from as little as $7 (for ACMI Members). During the school holidays, the ACMI offers interactive workshops, much like the Family Minecraft Days, which I took my family too in the summer break. The ACMI shop is always a winner, offering quirky gifts related to film, tv and digital culture. My family and I enjoy browsing this little hidden retail gem, and often go home with a gift for someone. All the above aside, the centre is about to launch a brand new activity; ACMI Family Sundays. Held on the first Sunday of each month, ACMI Family Sundays offer visitors and families all over Melbourne, the chance to embrace all that the centre has to offer in themed events. Best of all? It's all completely free. Each month, Family Sundays will adopt a theme to inspire visitor participation. Kicking off on 2 April, 2017, the first in the series of ACMI Family Sundays will be dedicated to YouTube. Visitors are invited to discover how everyday people are taking over the internet with online video. ACMI's expert team will be on hand to help families make their very own videos inspired by special guests, YouTube megastars Grace Mulgrew (Grace's World) and Debbie Doo (Debbie Doo's Kids TV) who will drop in on the day to reveal the tips and tricks for creating entertaining online content. 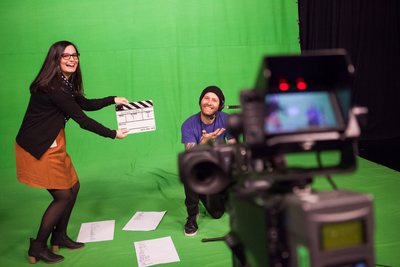 ACMI offers a world-class green screen studio, used for movie making workshops throughout the year. On the 2 April, 2017, the green screen studio will be used to celebrate Aussie Rules. Locals and visitors are invited to partake in their own Mark of The Year video or blooper reel, inspired by the AFL Kids YouTube Channel created by ACMI X co-workers Valleyarm Digital. Stars of the AFL Womens' League will drop in throughout the day to cameo in family creations. More themes to be announced soon. To find out more, head to ACMI HERE.